After the excitement of producing my first 3D prints wore off, it was time to get back to printing my water bottle cap. A few discussions with Noisebridge members revealed I was going to have a tough time printing the loop in the top of my original design. While the Ultimaker can print support material to hold up an overhanging object, it’s hard to remove after you are done printing, and I didn’t want to risk damaging the cap. I decided to remove the loop altogether. 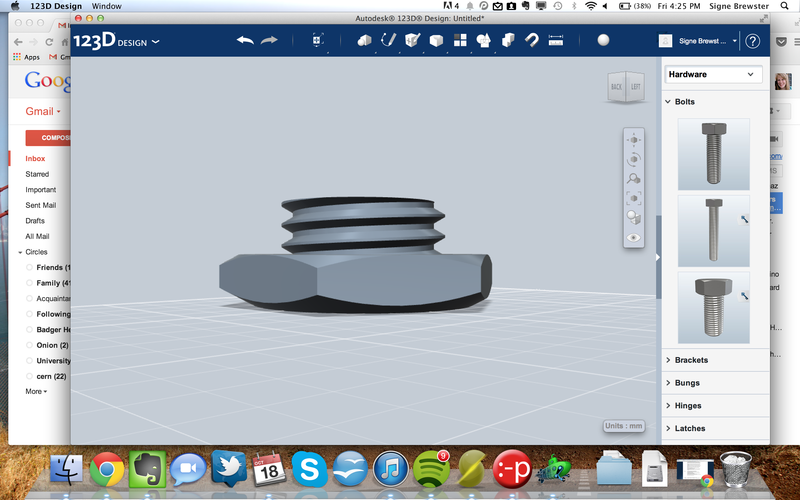 I started anew with the design and just chopped an existing design of a screw down, then flipped it. Voila, a water bottle cap. I ran the file through my software and the design began printing. It’s been a long time since I felt so helpless learning a new skill. If you miss a basketball shot, you keep shooting until you make it. If you don’t know why your iPhone is acting funny, you Google the problem until you find the trove of 5,000 other people who have had the same problem. But when you’re working with a 3D printer from 2010 that’s been modified over and over again by hackers, no one on the internet has experienced exactly the same problem as you. You’re on your own. That realization hit when the plastic filament feeding into the printer snapped halfway through the print job. I paused the printer and began inspecting the back part where I knew the filament generally went. But there were about three holes and a mess of gears, any of which could have been responsible for feeding the filament into the machine. It was something that should be so easy, but I was stuck. I had to ask another Noisebridger. Within minutes I was printing again, with a few tips for how I could have improved the print job as a whole. It was a good reminder of why learning through other people is important — this is a very new field, and tangential knowledge isn’t necessarily stored on the web. And it made it a bit easier to ask when five more questions inevitably came up (how does anyone 3D print anything on their own?). With the filament flowing, I settled back in to waiting. My layers started to look really messy. The plastic was globbing up in some places, creating holes where later layers of filament then fell down. It was ugly. 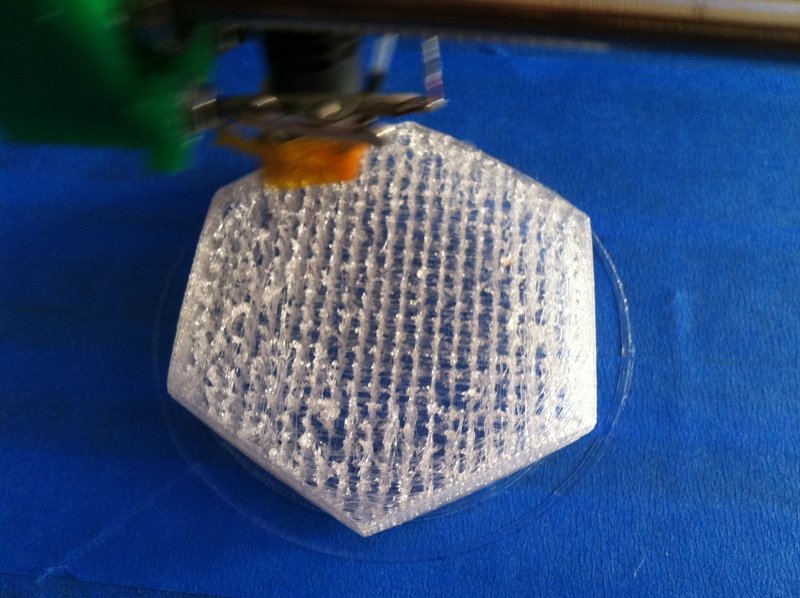 I slowed the print speed way down, but it didn’t have much effect. I decided to continue and hope the printer corrected for the shoddy construction. The printer finished off the top part of the cap solidly and then started on the neck. This was the nerve wracking part, as the threads had some fairly large overhangs that the printer could struggle with. 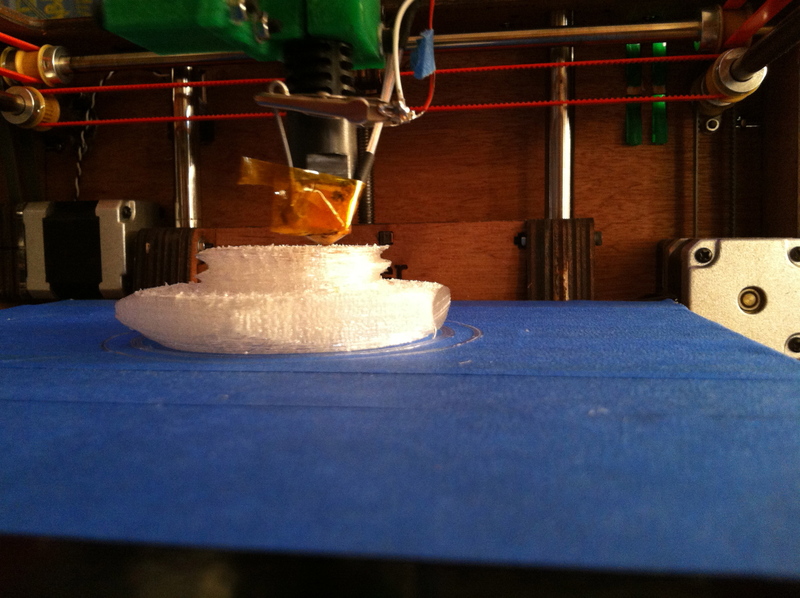 I slowed the print speed down and definite threads began to emerge. After roughly two hours of printing, the bottle cap was done. Then I noticed a very obvious flaw: It wasn’t water-tight. My shoddy printing meant water would flow right through it. 3D printing really is a craft, and one that I have yet to master. The cap is going to take another try. Are you using an Ultimaker? Maybe I can help you. Had similar challenges at the beginning. Meantime very good results. What material do you use from which company? What are your settings? 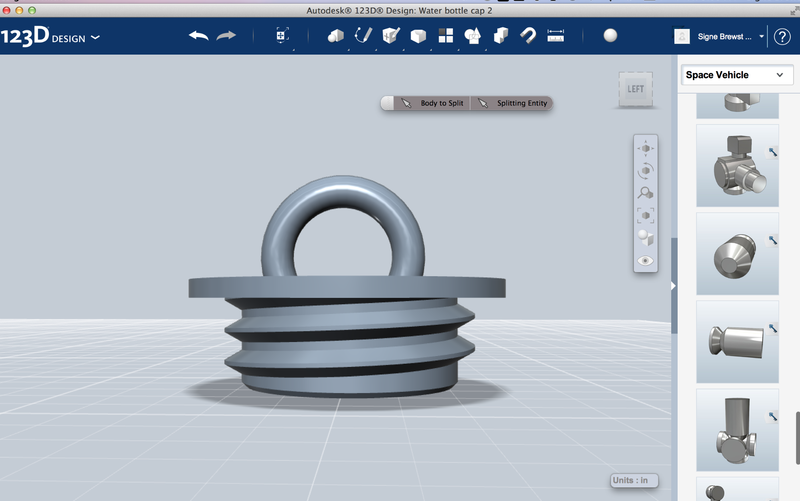 Do you use Cura? Firstly I could imagine that the temp. is too low. This could cause similar print failures you describe. I would try printing with 220-230C. Not too fast max 50mm/s. Feel free to contact me on twitter @DscheyH.